SHORTLY AFTER THEIR ELECTION this past November, a number of freshman left-wing Congressional Democrats announced that they would not be embarking on one of Washington’s most sacred rites of passage: an AIPAC-organized trip to Israel. These trips, which cost AIPAC around $10,000 a person, are essential instruments of the country’s largest pro-Israel lobbying group. They present an illusion of political moderation (the politicians meet with a handful of AIPAC-selected Palestinians), and gesture at a forgotten tradition of bipartisan Beltway consensus. For years, observers have speculated about when the Washington bipartisan consensus on Israel would crack; in a 2014 New Yorker piece on AIPAC, Connie Bruck noted an emerging “schism” between American Jews that posed a threat to Washington’s longstanding pro-Israel consensus. That “Great Schism,” as Jonathan Weisman of the New York Times recently described it, is now in full bloom, and it extends far beyond just the communal politics of American Jews. The events of the past week have crystallized this schism more than anything else in recent memory: the Senate’s vote to advance legislation that would allow states to break or withhold contracts from companies that boycott the Israeli government, the launch of a new political advocacy group called the Democratic Majority for Israel, and the Engel-Tlaib scuffle over the proposed trip to occupied Palestine. The Senate vote concerned what was initially a fairly standard measure written to reauthorize foreign aid to the Israeli and Jordanian governments, but Senate Republicans (Marco Rubio chief among them) with the assistance of AIPAC amended the “Strengthening America’s Security in the Middle East Act of 2019” with the BDS provision in order to, as the New York Times put it, “draw out the new generation of insurgent liberal representatives who have been critical of Israel.” The bill passed by a margin of 74-19, with seven abstentions. The lopsided roll call vote belies the bitter fight over the bill during the past two months. Senate Democratic leaders who ended up voting for the bill, including Minority Leader Chuck Schumer, all refused to even consider the legislation until Republicans agreed to a bill that ended the government shutdown. At the same time, civil rights groups like the American Civil Liberties Union exerted significant leftward pressure on Democrats not to support the bill at all because of the First Amendment implications of the Rubio-added provision targeting BDS activism. Though Senate Democrats showed rare spine in refusing to vote for the bill during the shutdown, a slim majority of them ultimately voted to pass the bill this week. However, of the bold-name 2020 contenders in the Senate—Bernie Sanders, Elizabeth Warren, Kirsten Gillibrand, Kamala Harris, and Cory Booker—it is notable that the first three voted no and the last two did not vote. 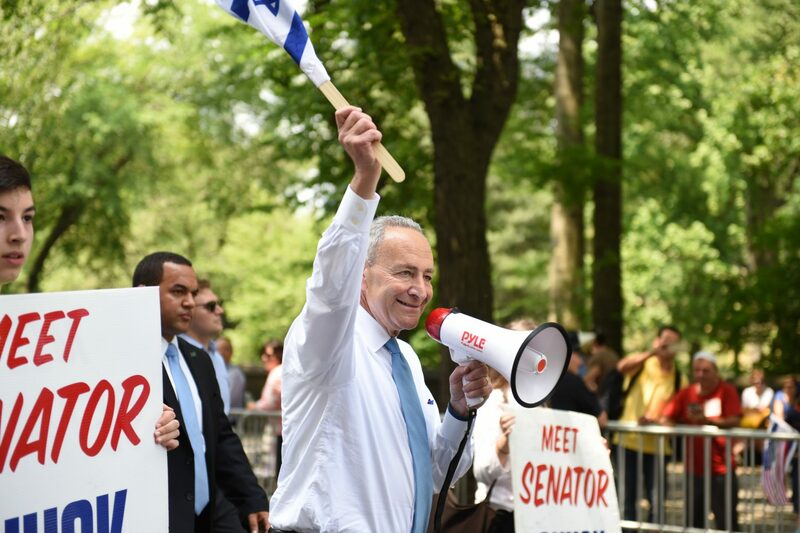 It’s easy to understand why, say, Senators Chuck Schumer or Bob Menendez would be comfortable joining forces with Republicans to go after BDS activists, as the two senior Democrats are enthusiastic allies of AIPAC and the Israeli government. Sanders and Warren’s motivations are no mystery either, as they’ve been staking out more progressive foreign policy positions for some time now. Though Gillibrand was once publicly cozy with AIPAC, she and the Israel lobby soured on one another after she withdrew her support from previous anti-BDS legislation that failed to get off the ground in 2017. Harris and Booker are a different story. Both politicians have long had friendly relationships with pro-Israel groups (excepting Booker’s vote for the Iran deal in 2015) and both have courted influential pro-Israel donors. Harris gave a private speech at AIPAC’s annual conference in Washington just last year. Their defections, while an aberration given the Democratic Party’s still-strong support for Israel in the Senate, suggest that new lines about what it means to be pro-Israel are being drawn ahead of 2020. A RECENT BuzzFeed News report declared that “Israel Will Be The Great Foreign Policy Debate Of The Democratic Primary,” citing interviews with a variety of named and unnamed Democratic political figures. Though the central contention of the headline is flimsy, the facts of the piece point to a now-stark divide among Democratic politicians. Marco Rubio nakedly intended to exploit this division with the anti-BDS amendment. By getting the bill through the Senate with the amendment intact, the Republicans will force House Democrats to vote against the bill, allowing Republicans to claim the mantle as the American political party that loves Israel the most. That pro-Israel sentiment among Democratic voters is sinking is beside the point; what’s at stake here are powerful, motivated donors who until now have split their dollars in an at least somewhat balanced way among Democrats and Republicans. Pro-Israel forces in the Democratic Party establishment see which way the wind is blowing, which explains the arrival of the Democratic Majority for Israel (DMFI) and its affiliated PAC to support pro-Israel Democrats. The purpose of DMFI, as described by the New York Times’ Jonathan Martin, is “to counter the rising skepticism on the left toward the Jewish state by supporting lawmakers and candidates in 2020 who stand unwaveringly with the country.” Sometime later this year, the group will officially launch a political action committee to directly fund candidates who align with the group’s vision; according to Martin, though not officially a part of DMFI, House Democratic Caucus chair Hakeem Jeffries could “be one of the first beneficiaries of the new group” to help him ward off a future primary challenge from the left. The single reason for DMFI’s existence, Eliot Engel’s sniping at Rashida Tlaib, and the Republican BDS bill ploy is that the Democratic Party is drifting from the hardline Israel politics masked for the last few decades by the guise of bipartisanship. This doesn’t mean that the American government’s relationship with Israel is about to radically change, but it does suggest that the overdue fight to make such a change has finally arrived.